US President Barack Obama marveled that playing golf with Tiger Woods was like teeing it up with someone from “another planet.”Obama was still shaking his head at the other worldly skill of the 14-times major champion, after meeting up with Woods for their first-ever round together on Sunday. “He plays a different game than I do,” said the president, an enthusiastic weekend golfer, whose scores are guarded like a state secret. “He is on another planet,” Obama told ABC7 television from San Francisco. Woods, the first African-American golfer to win a major title from his 1997 triumph at the Masters, and Obama, the first African-American to be elected as US President, teed off at a luxury golf resort in Florida. 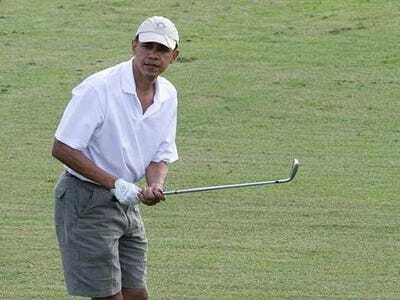 Woods and Obama defeated US trade representative Ron Kirk and Houston Astros owner Jim Crane, who also owned the resort course where the elite foursome played away from the eyes of the media, who complained about being ditched. Woods, who is chasing the all-time record of 18 major crowns won by Jack Nicklaus, said he was asked to play alongside Obama during an off weekend in his PGA Tour play. “There’s a process that’s involved and I was invited to play,” Woods said. “It was an invitation that certainly you don’t turn down, especially being he’s an avid golfer and so am I.